Carbon Balls (Daldinia Concentica) are known by several names. Coal Balls, Cramp Balls and King Alfred’s Cake are also localized terms for the mushroom. The latter name being perhaps the most interesting. Alfred the Great lived from 849 to 899 and at one point was in exile. While in hiding he was left in charge of the cakes which burned after he fell asleep. While hiking on Saturday we encountered this tree with black stains like spray paint on it. Closer inspection revealed the black to be a stain from spores of the carbon ball fungus that is growing there. 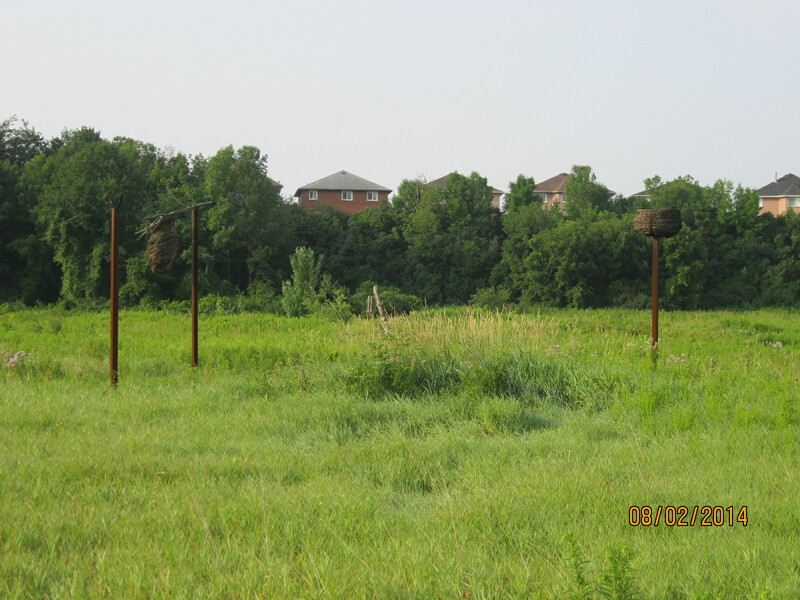 Carbon balls prefer dead ash trees and with the amount of damage done by the emerald ash borer there should be plenty of habitat for them now. The blacker examples make great fire starters. Once split they start smoldering from a spark and will carry on burning for an extended length of time. Various cultures have used them as a means of carrying fire from one location to the next. 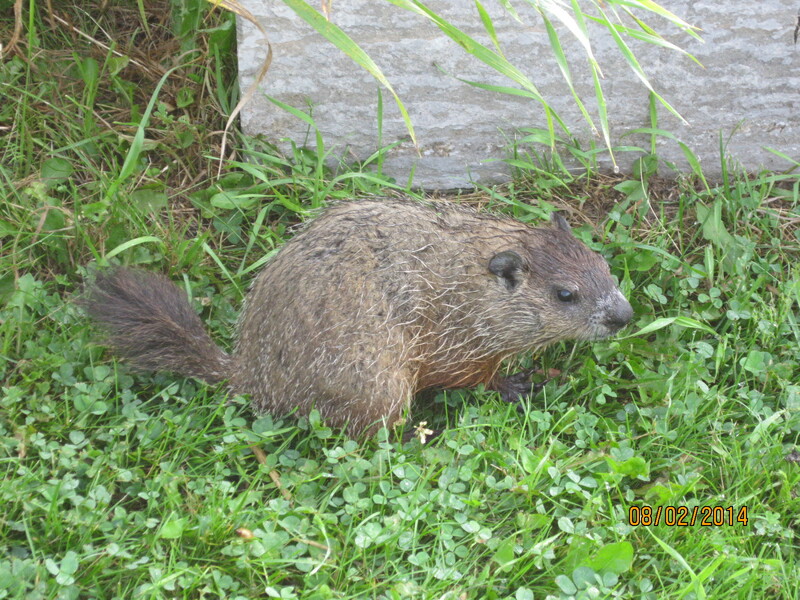 They grow to just under two inches and there were a couple of examples close to that size. These mushrooms survive over the winter with a reduced growth rate that results in a series of concentric rings that are described by the Latin name. 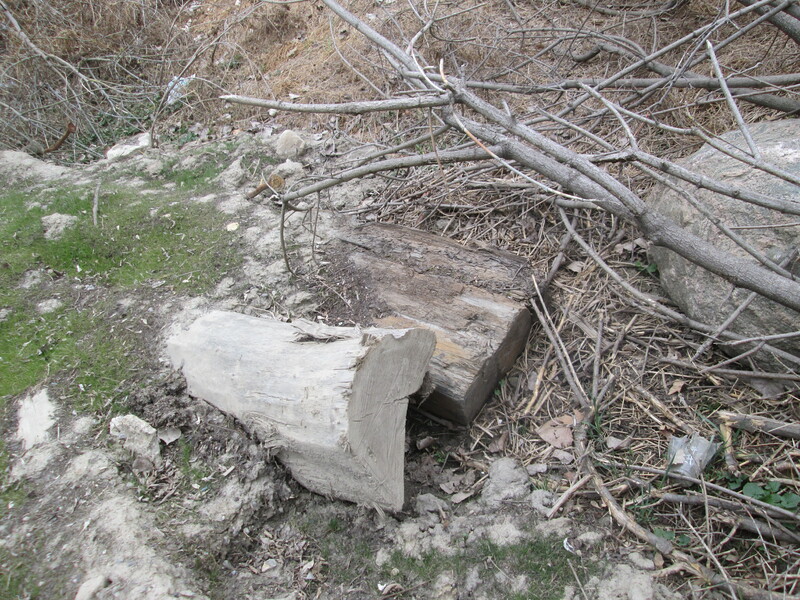 The growth rings suggest that this example is about 12 or 13 years old. 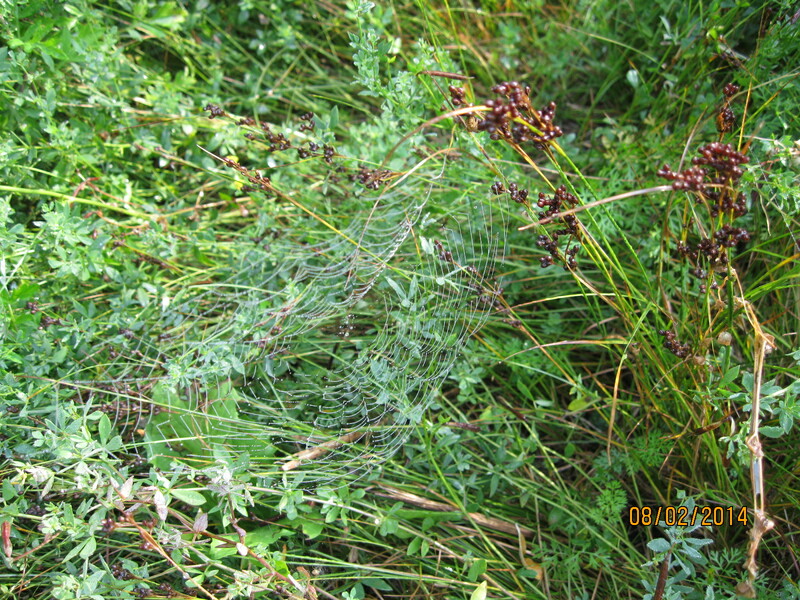 The ostilole can be seen like a crack in the cross section and is used for the release of spores. This mushroom is inedible. 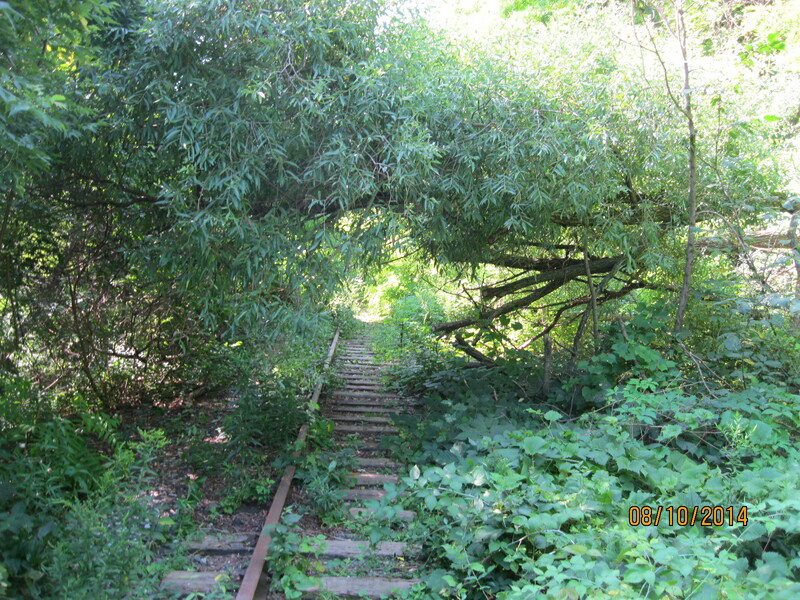 This entry was posted in Hiking GTA and tagged carbon balls on September 9, 2018 by hikingthegta. 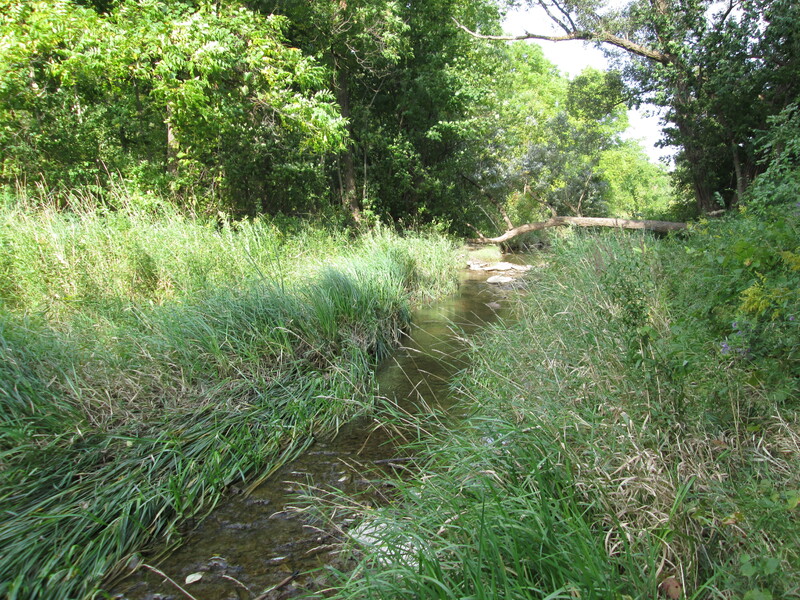 When Yonge Street was cut through the forest by The Queen’s Rangers in 1796 it opened up the area for settlement. Small towns formed at almost every intersection. 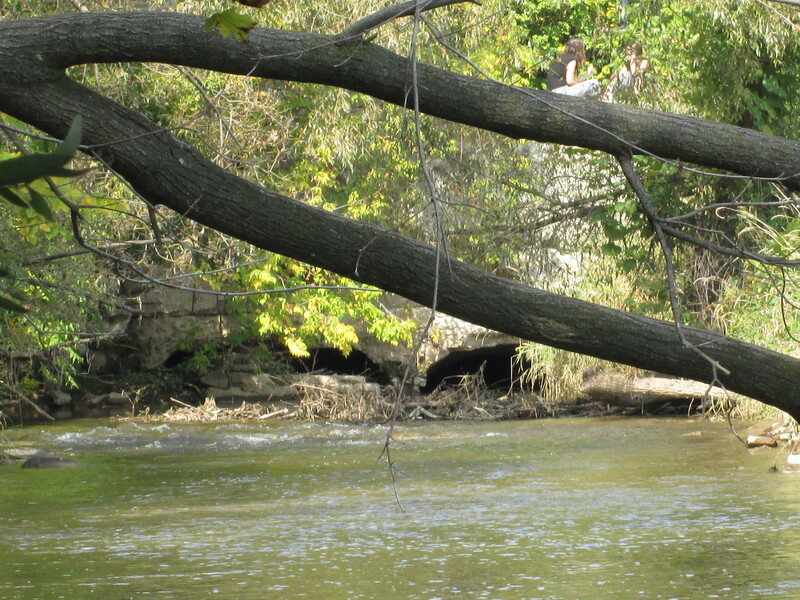 An intersection such as Yonge Street and York Mills Road where a river passed through with good mill sites was assured of attracting industry. 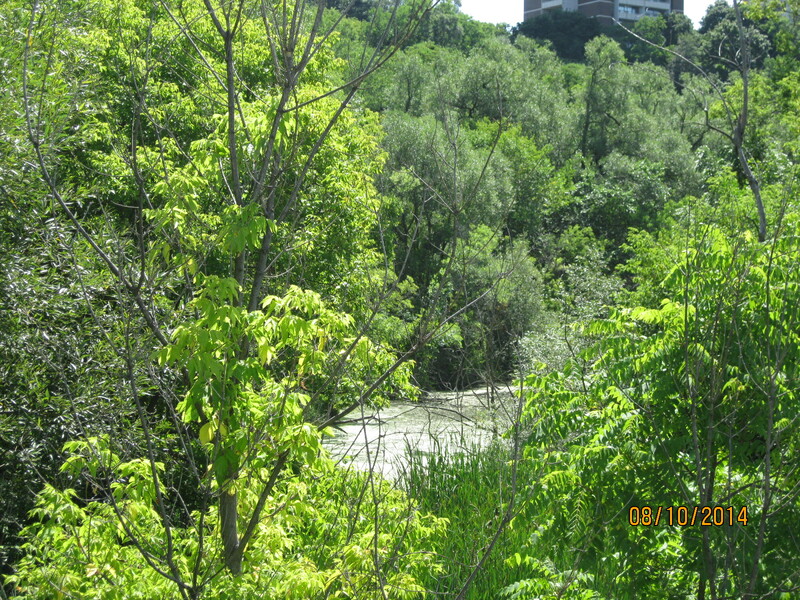 This area is known as York Mills after it’s post office but is also well known as Hoggs Hollow. 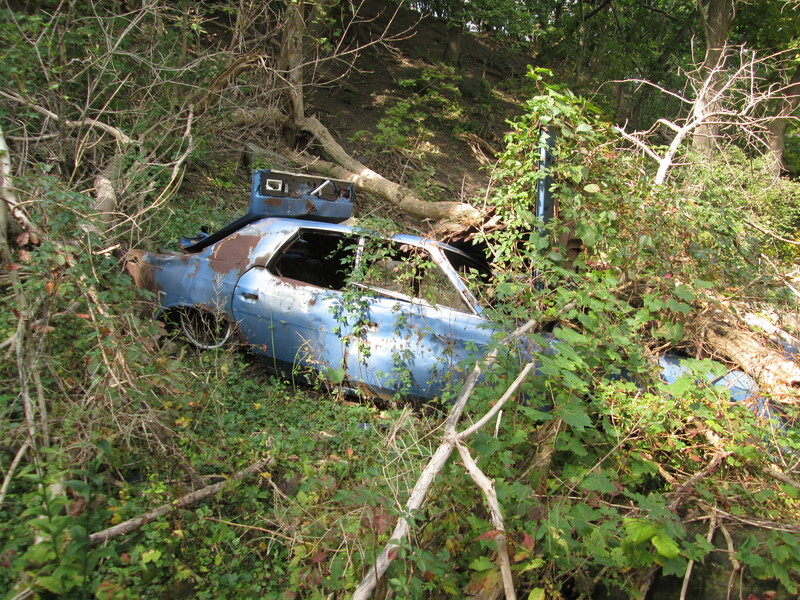 I parked on Mill St. in the parking lot on the east side of the West Don River. It was overcast and 7 degrees. 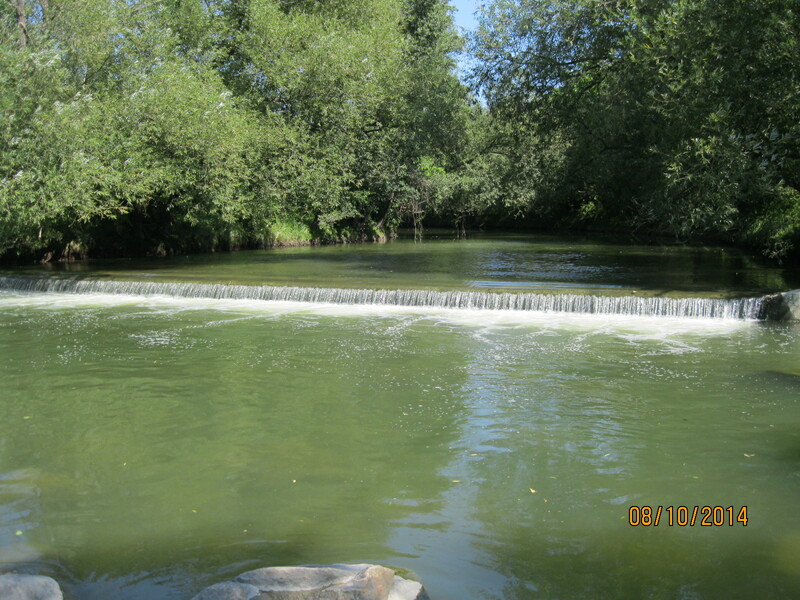 The first mill was opened as early as 1804 by Samuel Heron. Millford Mills was opened in 1817 and supplied the first name to the town. This mill was bought by James Hogg in 1824. 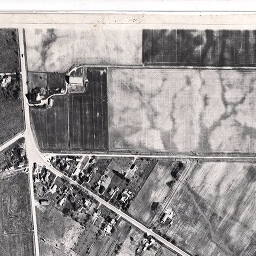 In 1856 a subdivision plan was developed for Hoggs property by his sons which was to be called Hoggs Hollow. Only a few houses were built at this time and the lots were not all built upon for over 100 years. 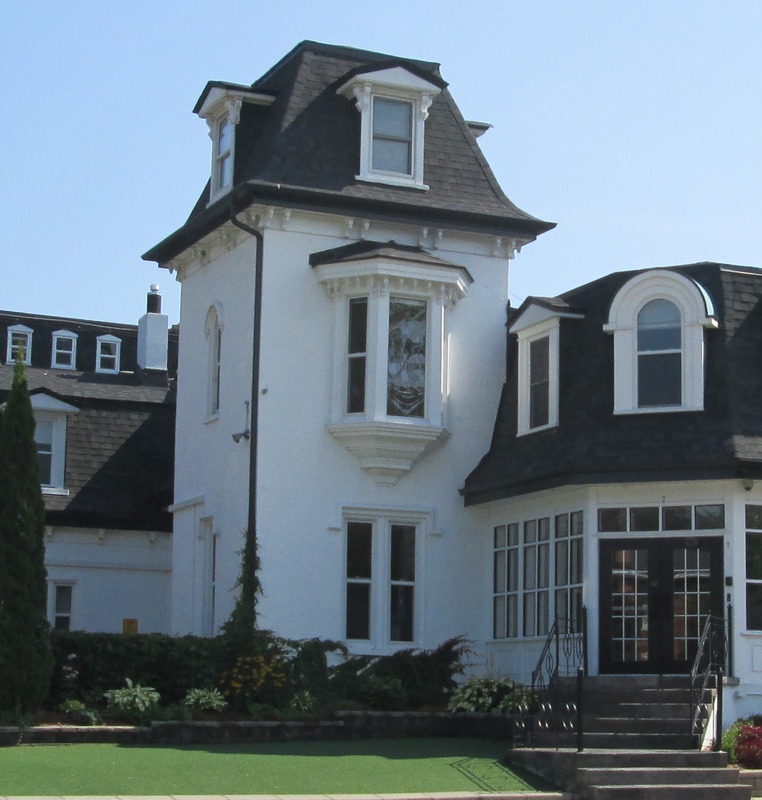 James Hogg built the York Mills Hotel in 1857 and it is one of only half a dozen remaining original buildings in the community. 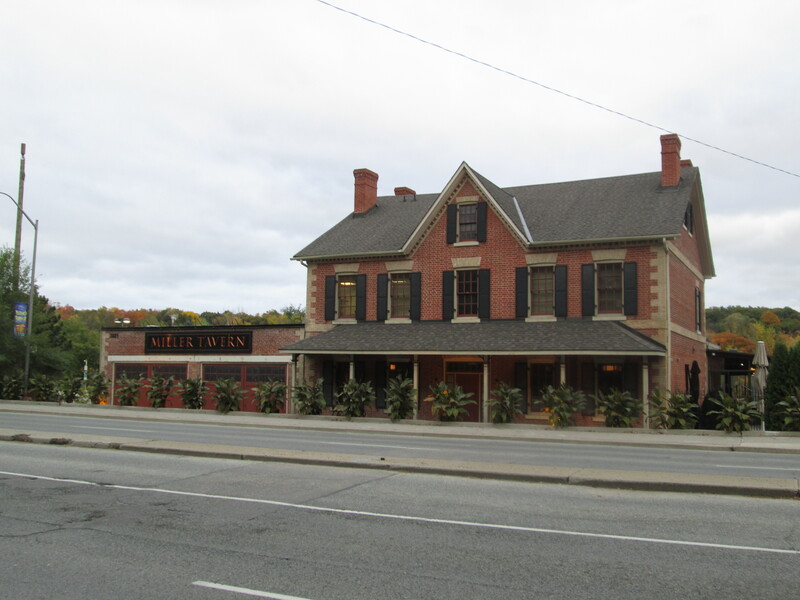 Having changed hands many times, today it serves as the Miller Tavern. Hogg added a general store beside it on the south. He also had a tannery and a distillery. 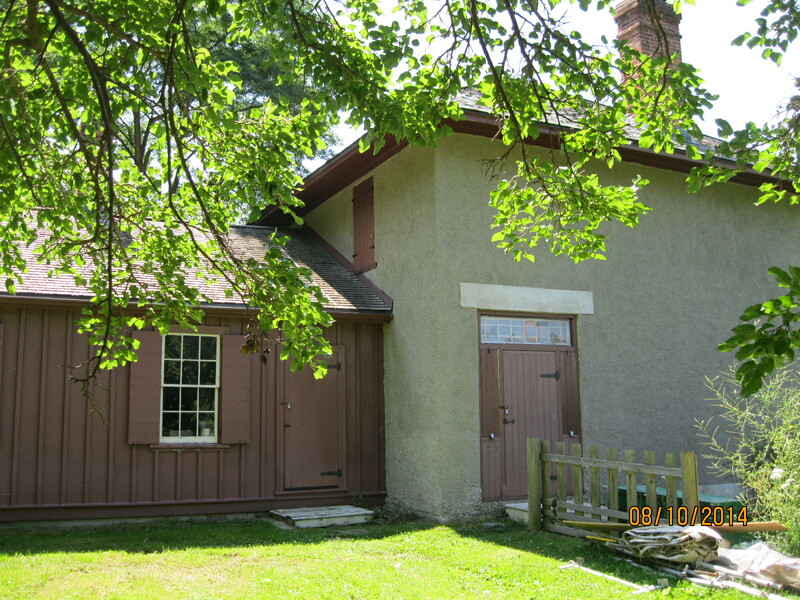 The general store served for awhile as a change room for skaters using the York Mills Skating Rink which was formed each winter on the site of today’s parking lot. 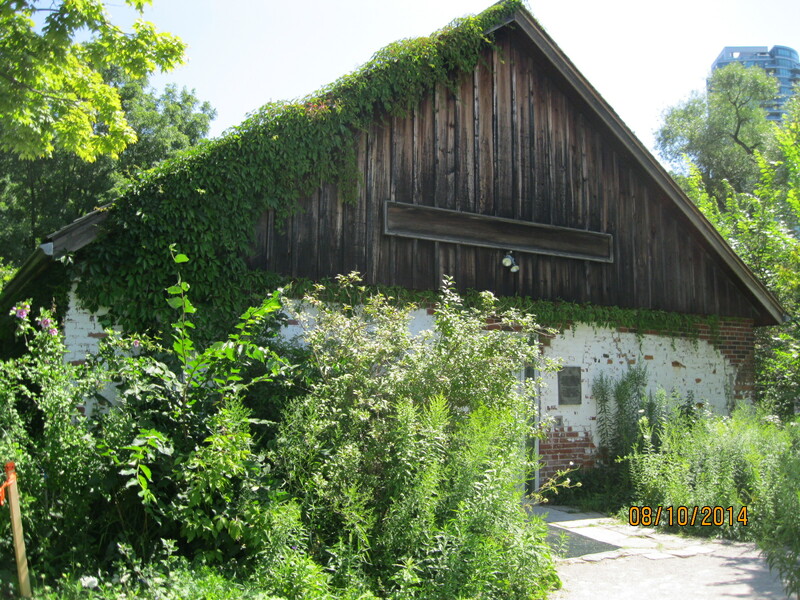 The cover photo shows the tavern and the general store, turned change room, as it appeared in the 1950’s. Today the tavern has been restored to it’s original brickwork and the old store is gone, having been destroyed by fire. 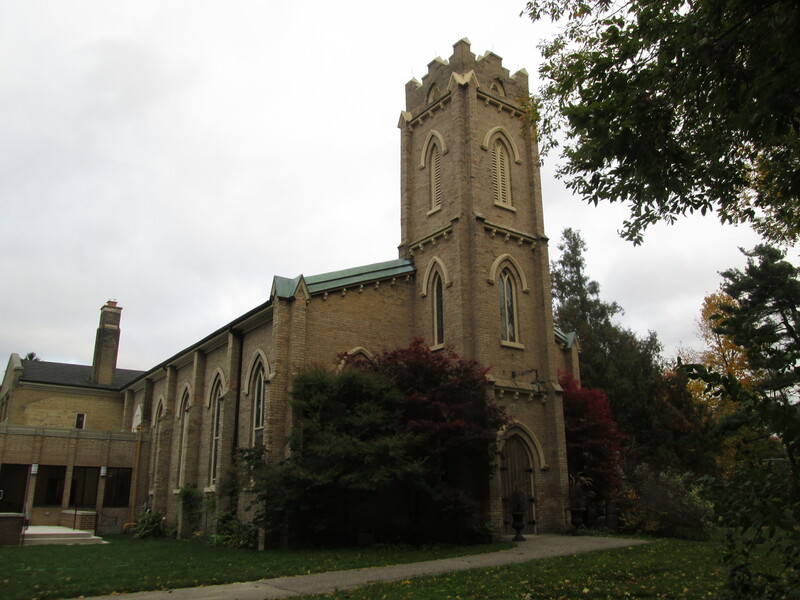 The York Mills Presbyterian church was built on the east side of Yonge Street on land provided by James Hogg. When the family developed the subdivision plan the church was moved across the street on the hill side, directly opposite of the tavern. The church was closed and demolished in 1889 and the cemetery was eventually forgotten. 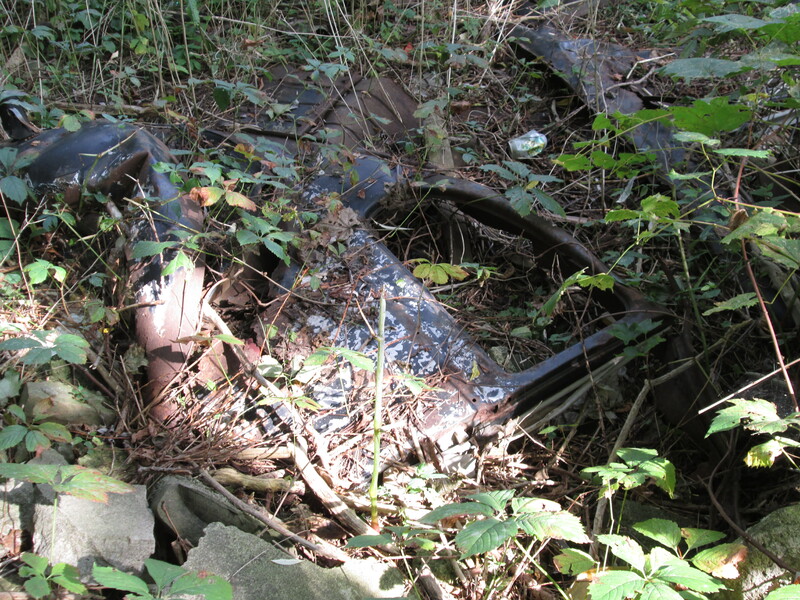 It was rediscovered in 1955 when the area was being developed for residential use. Twenty five graves were uncovered with two of them belonging to members of the Hogg family. 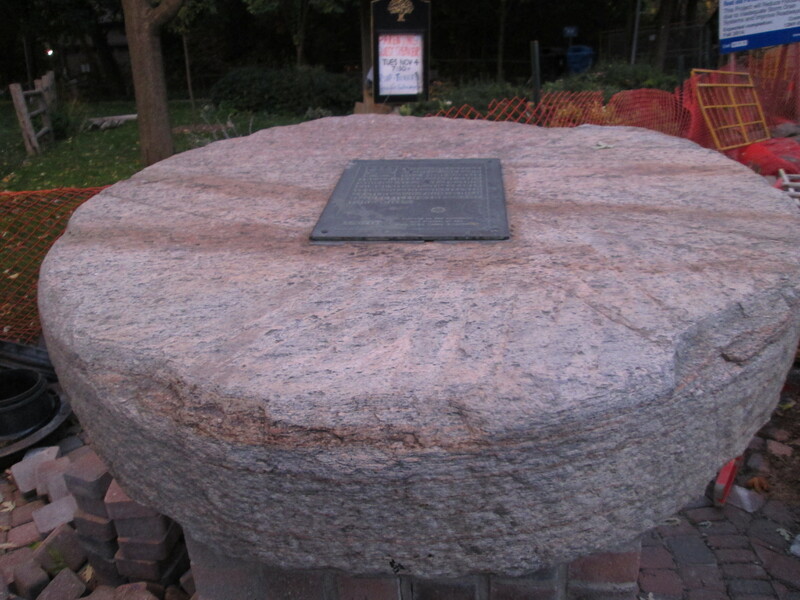 A historical plaque marks the spot today. 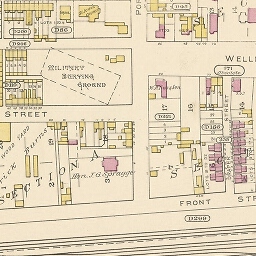 In the 1877 Historical Atlas the church is marked by “Pres” right below the name York Mills. Their cemetery is marked with an asterisk just above it. Too bad no one checked the old map before they dug. 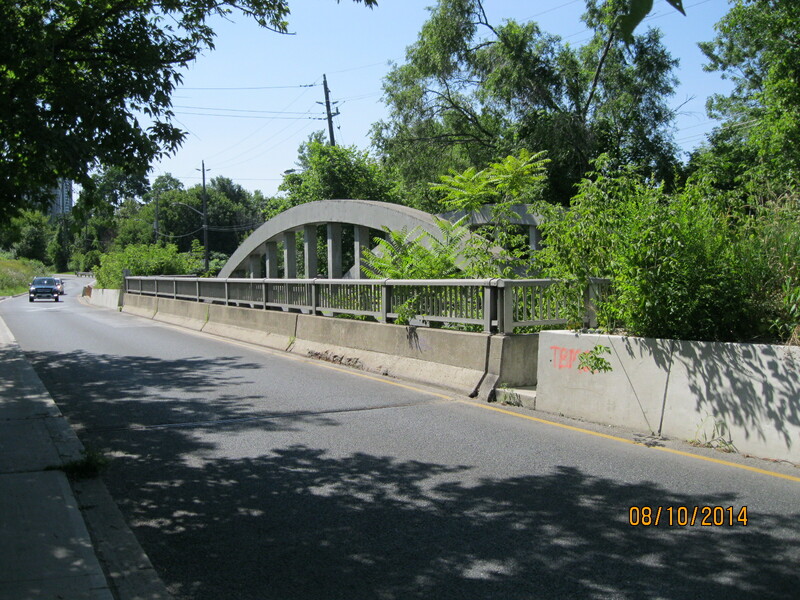 The Yonge Street bridge in Hoggs Hollow was destroyed in 1954 during Hurricane Hazel and was replaced with a wider one a year later. 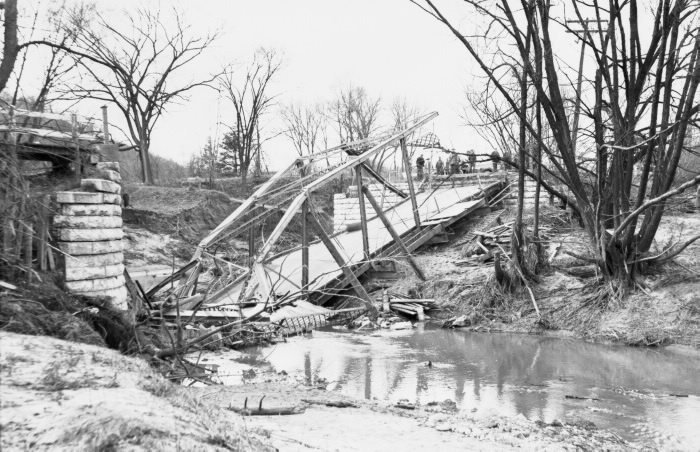 The archive photo below shows the bridge following the hurricane. 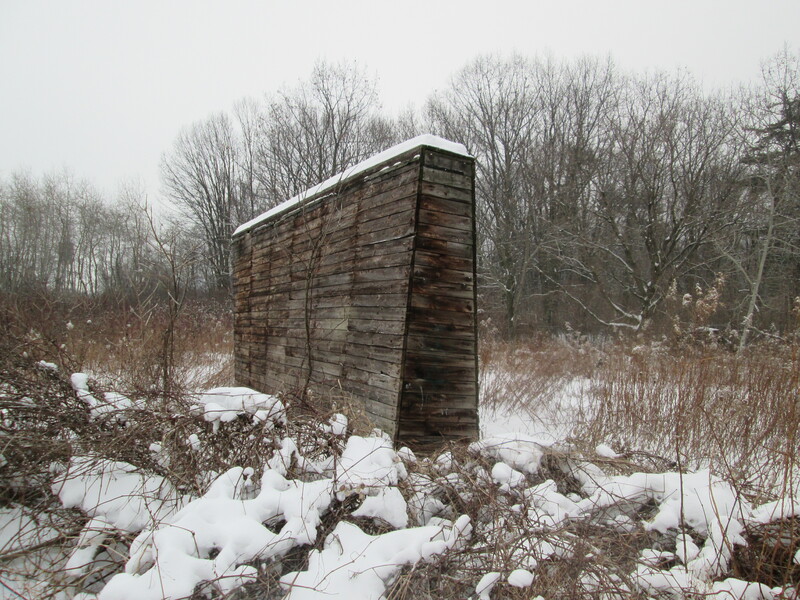 North of York Mills Road are two of only three mill worker cabins that were built in the Hoggs Hollow subdivision. They have been preserved and moved to their current location on Yonge Street where they guard the entrance to a fancy restaurant. Ironically, it is a place the original inhabitants of these homes likely couldn’t have afforded to eat at. 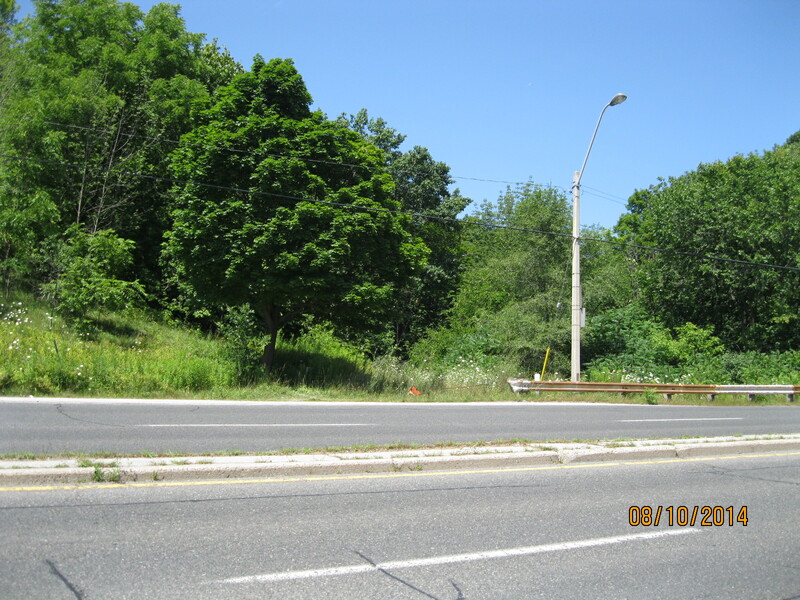 On the east side of Yonge just north of York Mills Road is the old walkway up the side of the hill to St. John’s Anglican Church. The church was started in 1816 and the present building was erected in 1843. 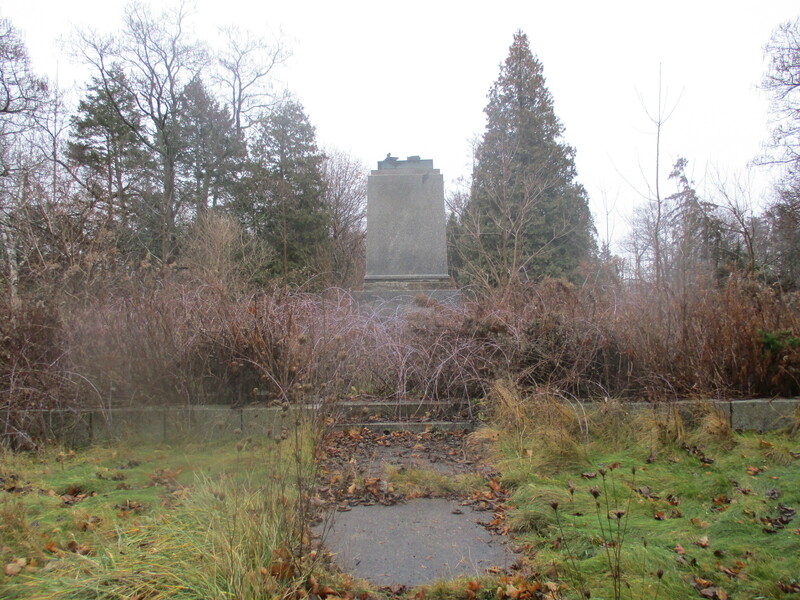 The church has the only active cemetery in York Mills and there are many prominent early settlers buried there. I saw one grave marker dated 1820. This church is marked as EC in the historical atlas for England Church and an asterisk marks the grave yard. Walking through the cemetery brings you to the Lychgate. A lychgate is a roofed gate found on traditional English churchyards. The word lych come from the Saxon word for corpse. 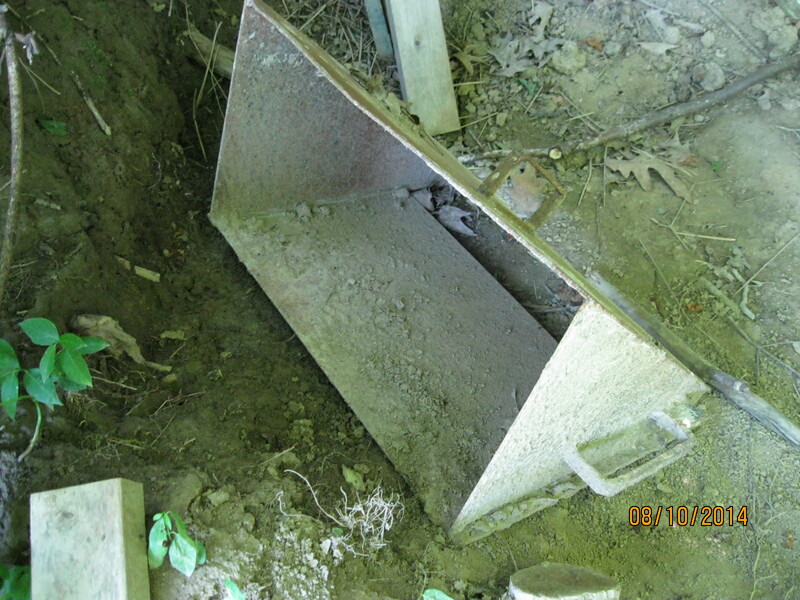 The corpse would rest under this roof while part of the service was read before advancing into the grave yard for burial. 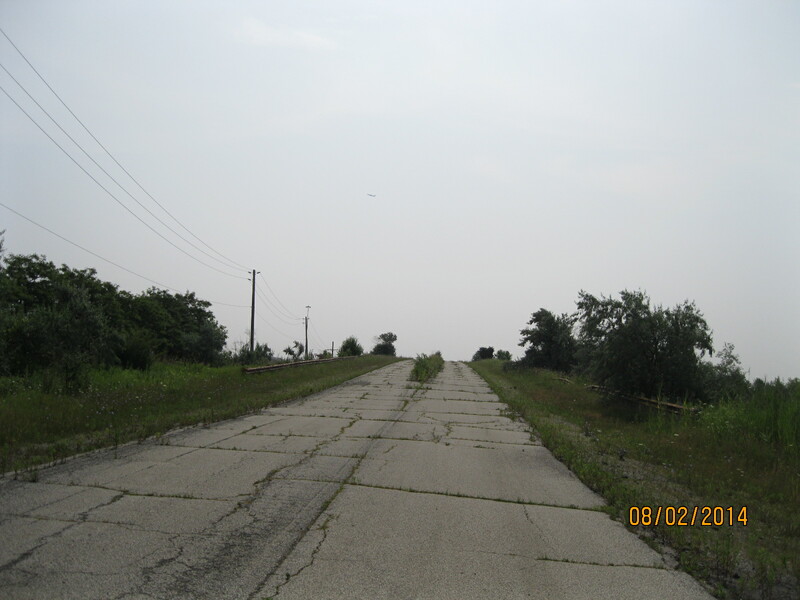 When Yonge street was built in 1796 it was thought that the valley was too steep and so the old road runs across the eastern rim of the valley. When Yonge Street was straightened a few years later this became known as Old Yonge Street. Turning to the right will bring you back to York Mills road. 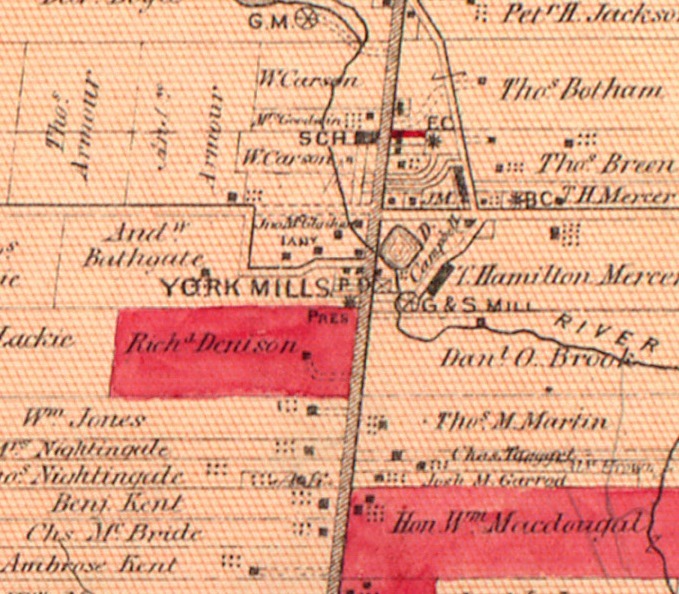 Just to the east is the former site of the York Mills Baptist Church erected in 1833. The church was closed in 1945 and demolished in 1948. The cemetery was just to the east of the church and it remains today, tucked in a small lot behind a hedge. The church is marked as BC in the atlas and has the usual asterisk to mark the graveyard. 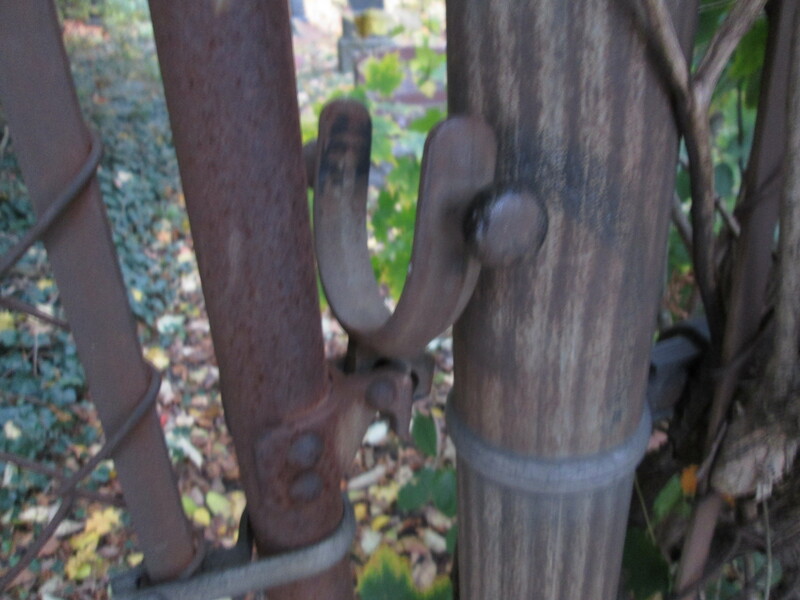 The gate has a unique old latch that drops over the gate post. The church built a manse for their pastor’s family in 1840 on the lot to the east of the cemetery. Returning to Old Yonge Street you can follow it back to Mill Street where the name changes to Donino street. A couple of short blocks later is a memorial to the towns milling past. 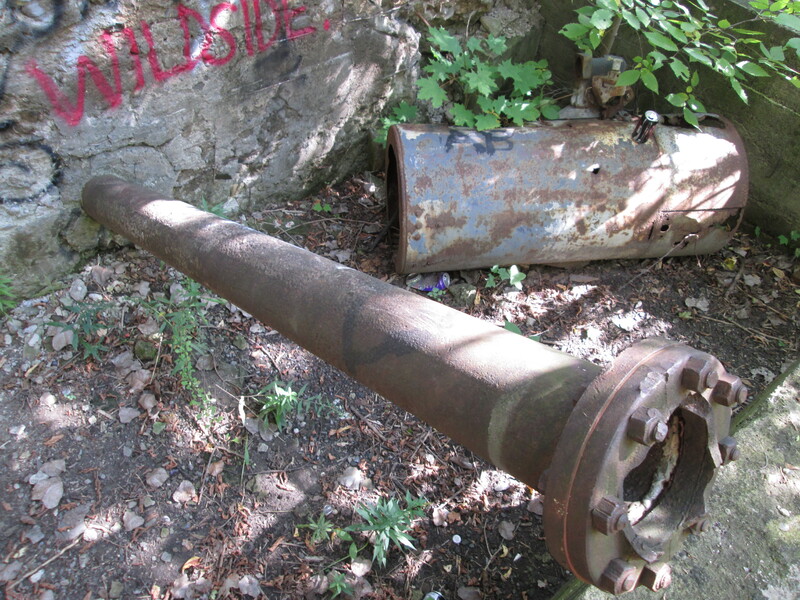 The grinding wheel from the last mill to close in the valley (1926) is preserved here. 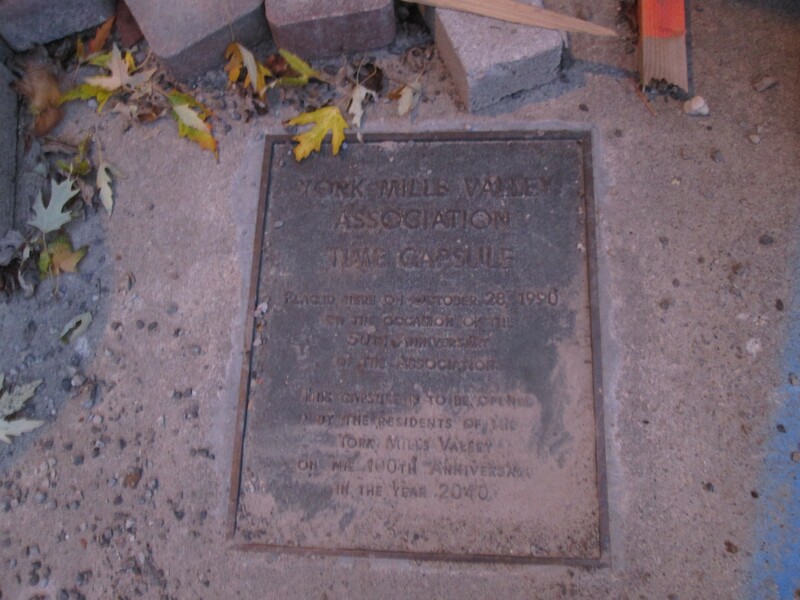 A time capsule has also been buried in the parkette. It is set to be opened in 2040. 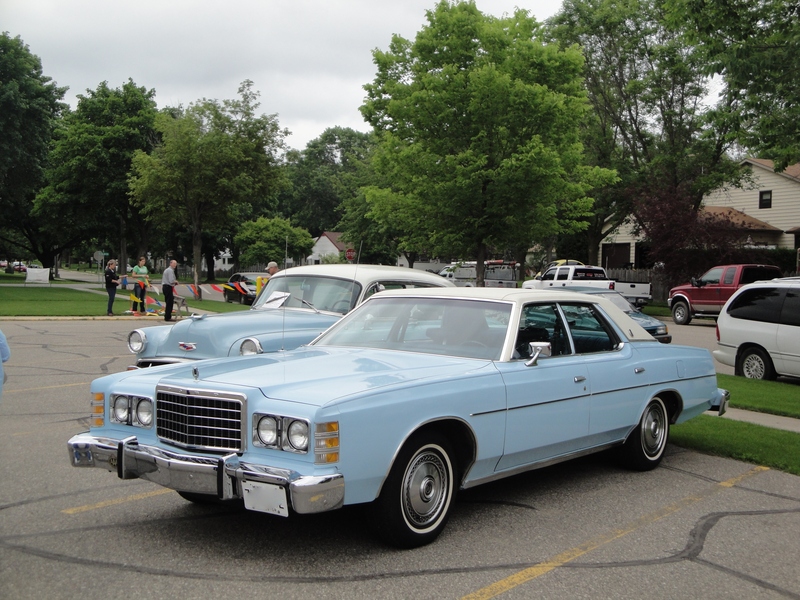 As you return to the car you reach the house of George Pratt. 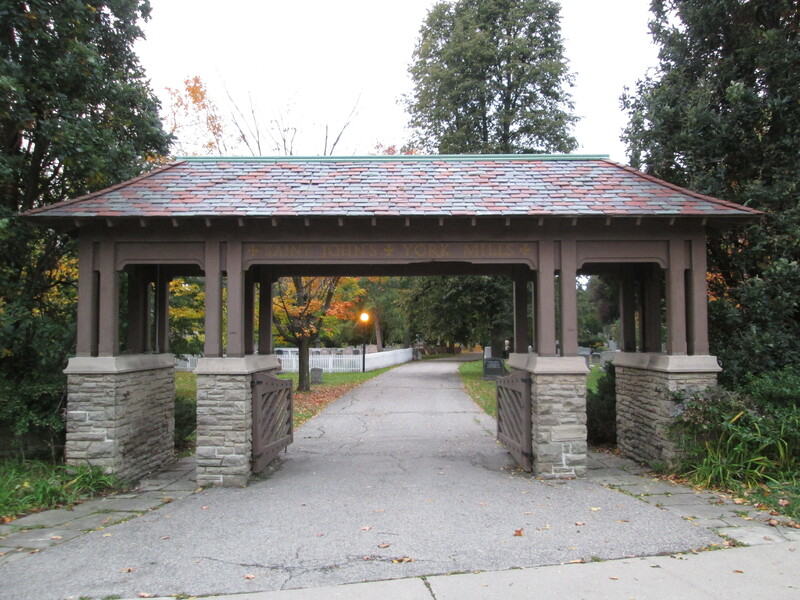 George ran a mill in the area of York Mills park. He built this house in 1886. 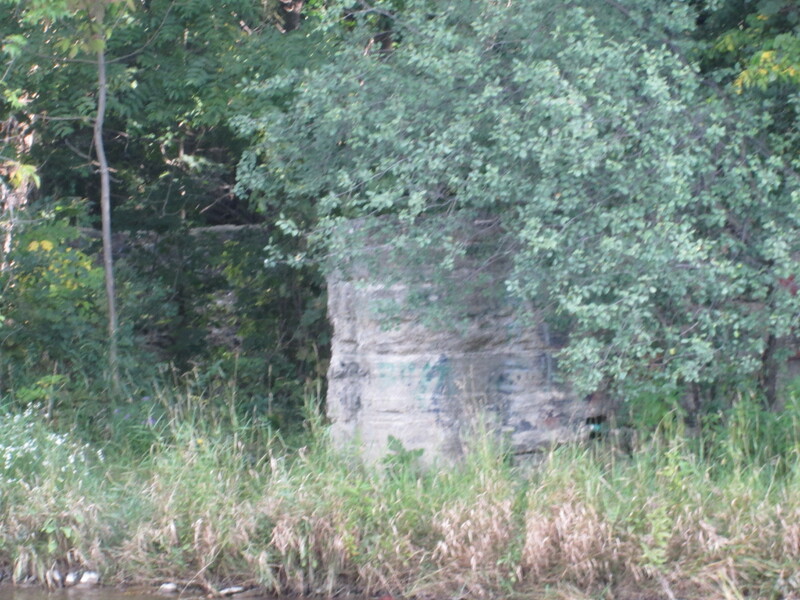 The old mill dam is almost under the Mill Street bridge. 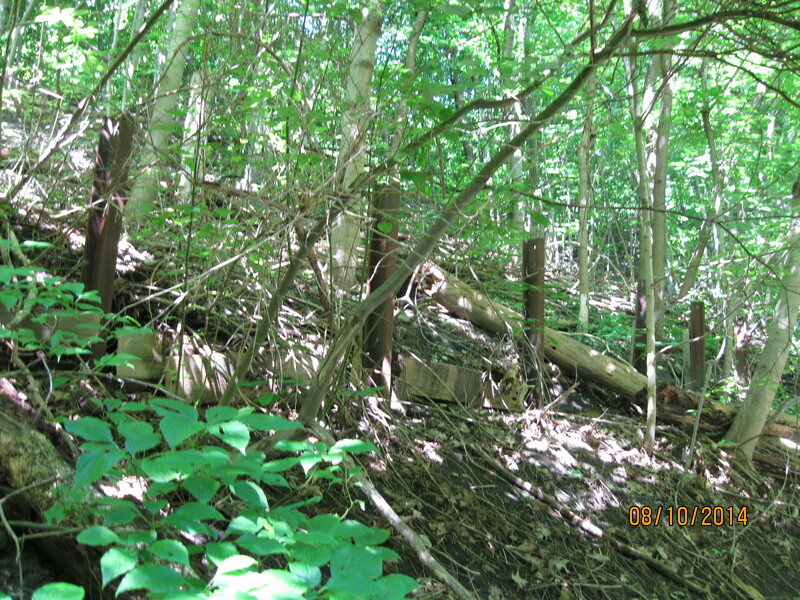 Old photos show a large wooden dam in Hoggs Hollow. 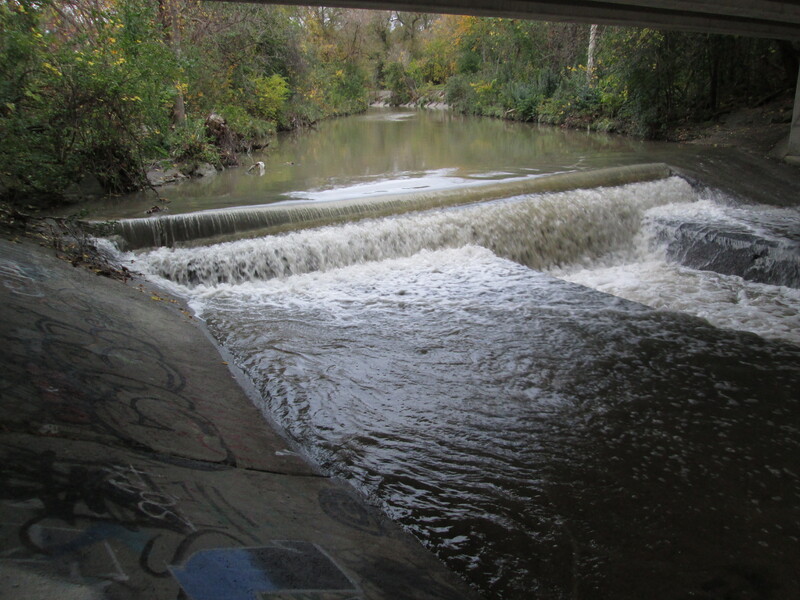 This entry was posted in Don River, Hiking GTA and tagged Hoggs Hollow, James Hogg, Jolly Miller, Mill Stone, St. Jphn's Anglican Church, Time Capsule, York Mills, York Mills Baptist Cemetery on October 19, 2014 by hikingthegta. It was sunny and warm, a beautiful day for a hike. I parked at the top end of Pottery Road in the Loblaws parking lot. 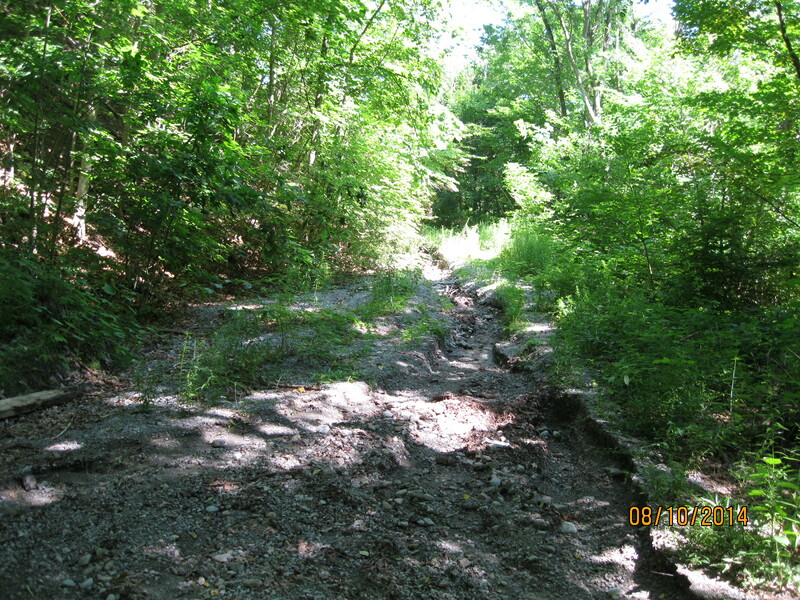 I also hiked along the old abandoned roadway of Pottery Road but that will have to be described separately due to length. When Governor Simcoe arrived in 1793 to build his town of York (Toronto) he needed a large supply of sawn lumber. 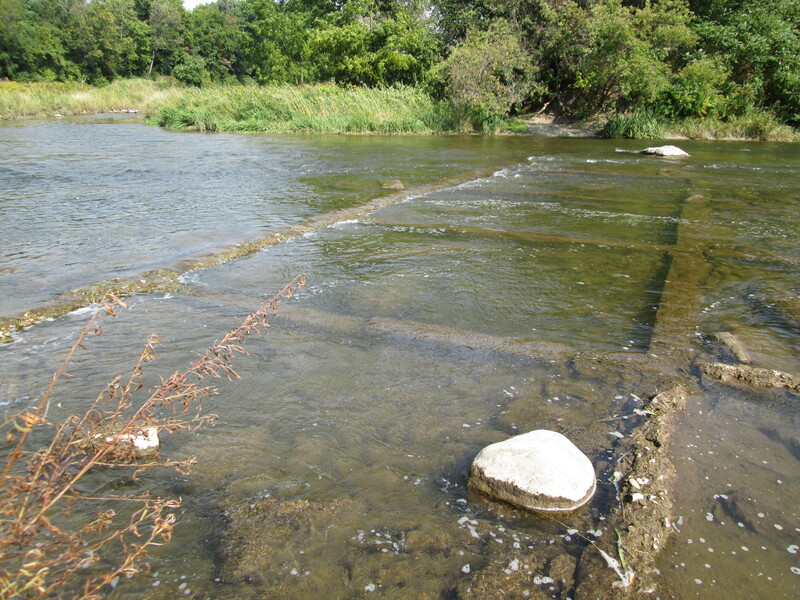 The only other mill at the time was the King’s Mill (now Old Mill) on the Humber River. As it was a government run mill it was unreliable and went through many changes of millers due to crazy rules that made it impossible to recoup your investment. 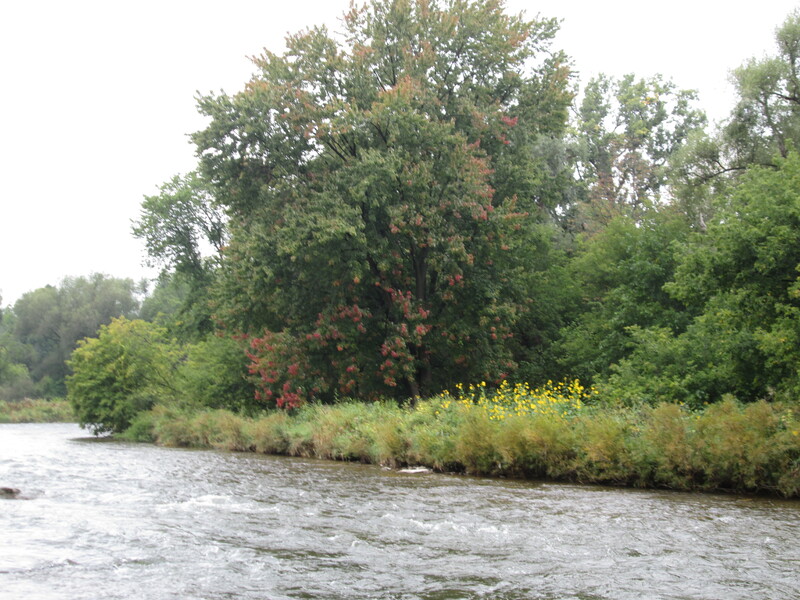 Simcoe brought Isaiah and Aaron Skinner in and granted them 200 acres of land in the Don River valley. 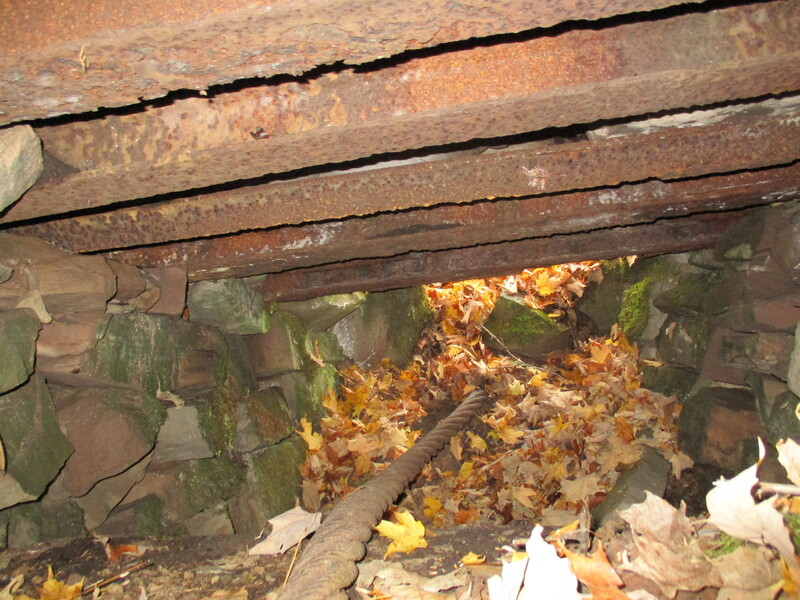 They built a sawmill in 1794 and a grist mill in 1795. 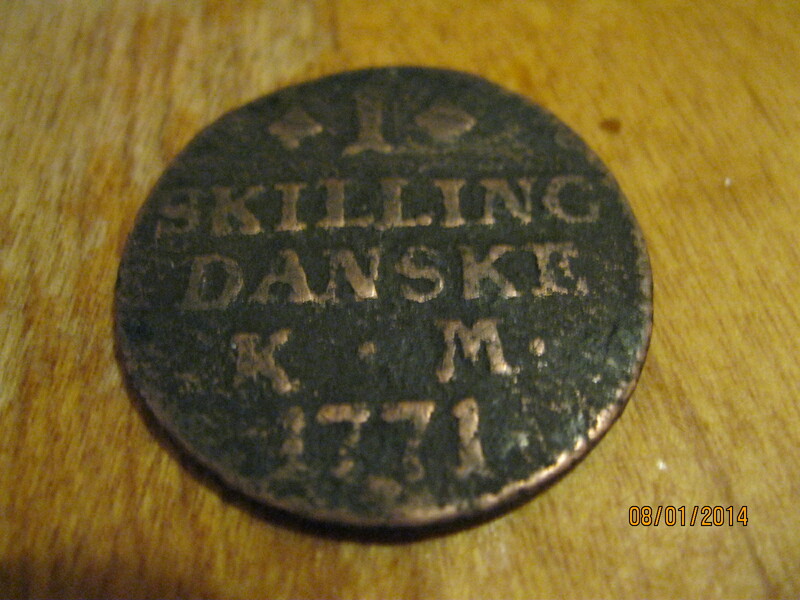 The Skinners sold the mills to Parshall Terry in 1798 and when he drowned in 1808 the mills passed to Timothy Skinner who ran them until he was killed in the war of 1812. Terry built the older portion of the Terry House, that part at the back which was made of logs. 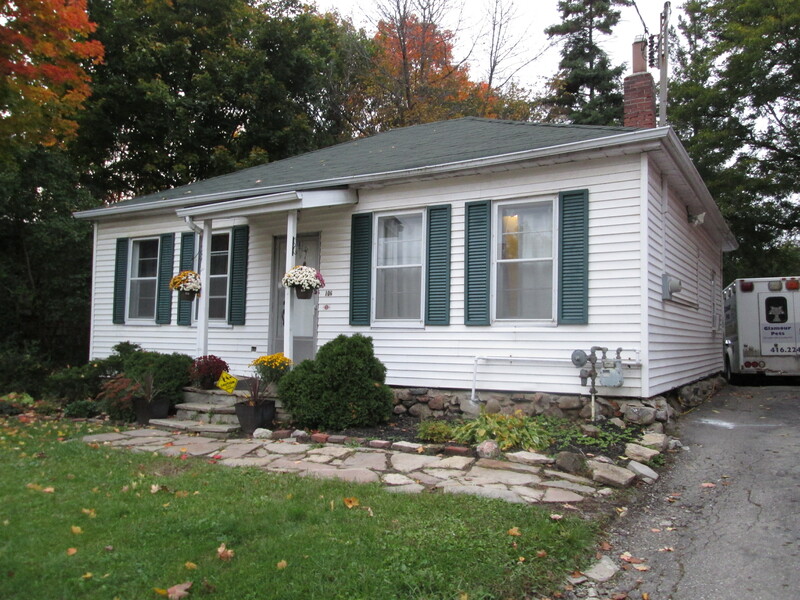 The front part with the two chimneys was a later addition. 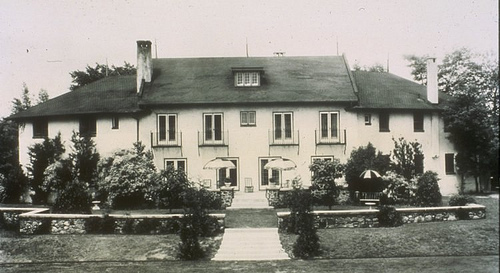 Taxes were levied on the number of chimneys you had, so having three fireplaces was a luxury. 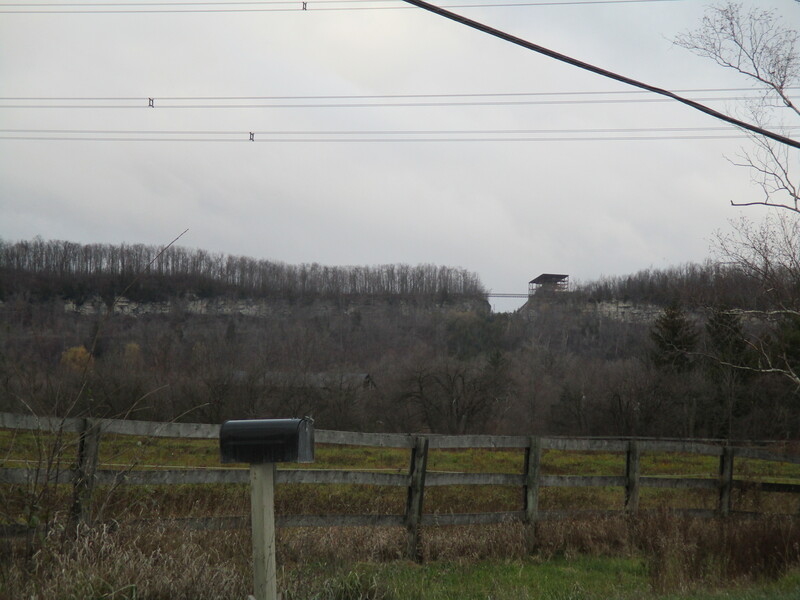 This picture shows the back end of the paper mill. 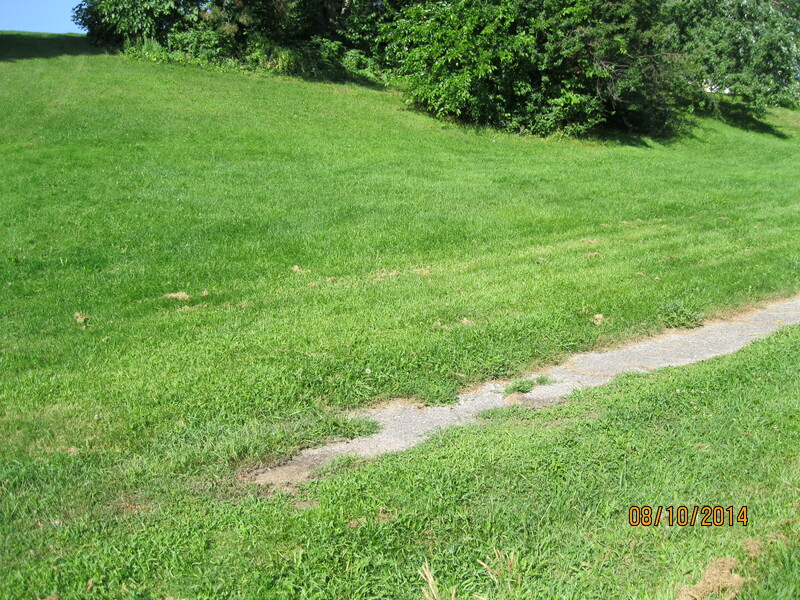 The mill race ran down the left side of the mill and this is where the mill wheel would have been. The tall chimney was added about 1900. In the cover photo the chimney is contrasted with the urban towers of Toronto in the distance. In 1822 Colin Skinner came into a partnership with the idea of chasing a bounty for being the first paper mill in Upper Canada. They didn’t win the bounty but did become the first mill to install paper making machinery. 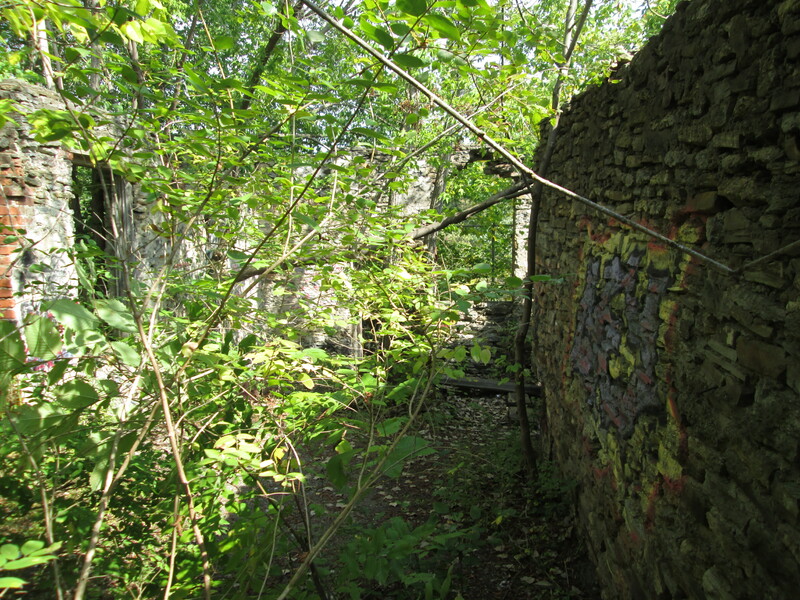 Eventually the paper mills spread into three locations and became a major industry in early Toronto. When the mills closed down they were used for awhile to stable the horses from the brick works. 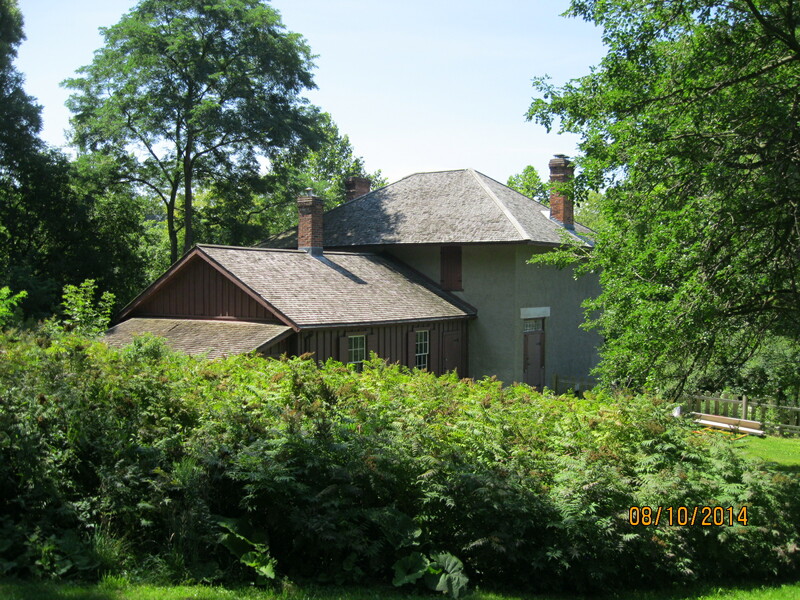 Later they were the home of Whitewood’s Riding Stable. 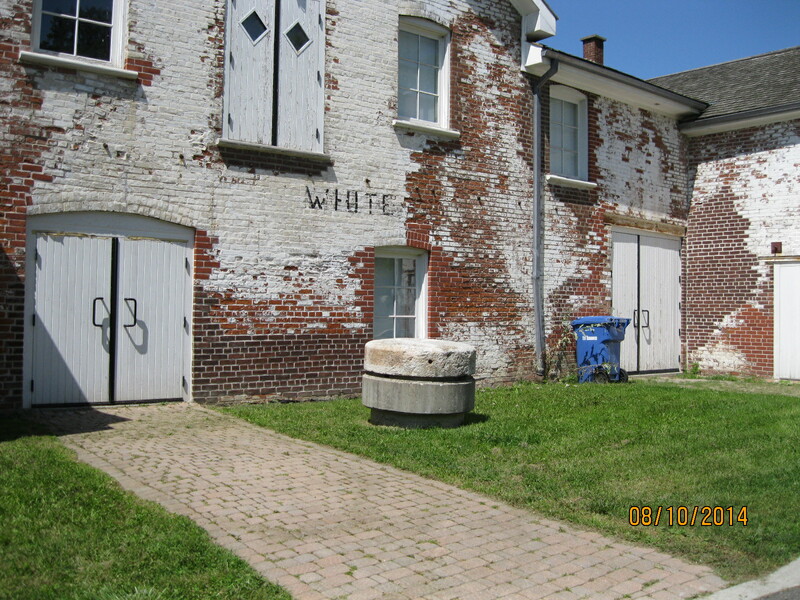 The word “White” remains on the side of the old mill. Also, note the old mill stone mounted on the lawn just outside the door. 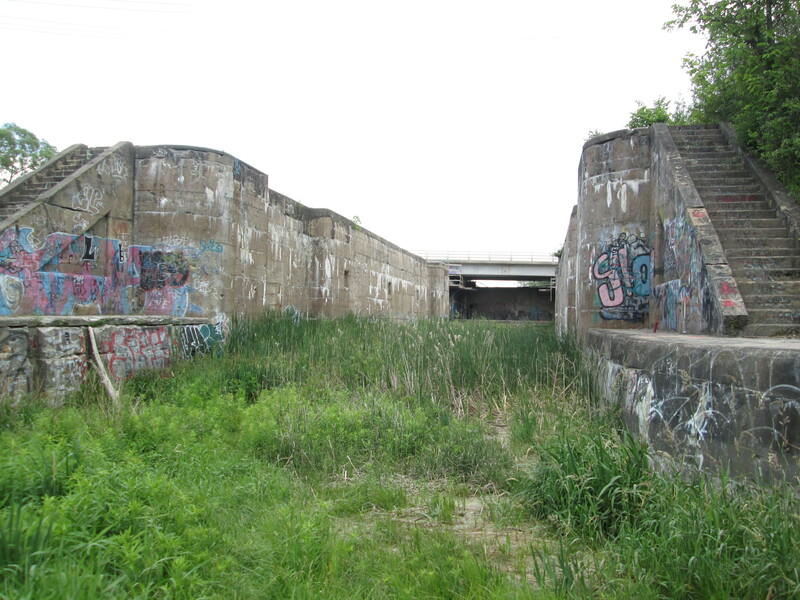 When the Don Valley parkway was built the Don River was re-routed so that the large curve that used to pass through Todmorden and power the mills was cut off by the berm of the highway. The river was straightened to run along side the railway line. 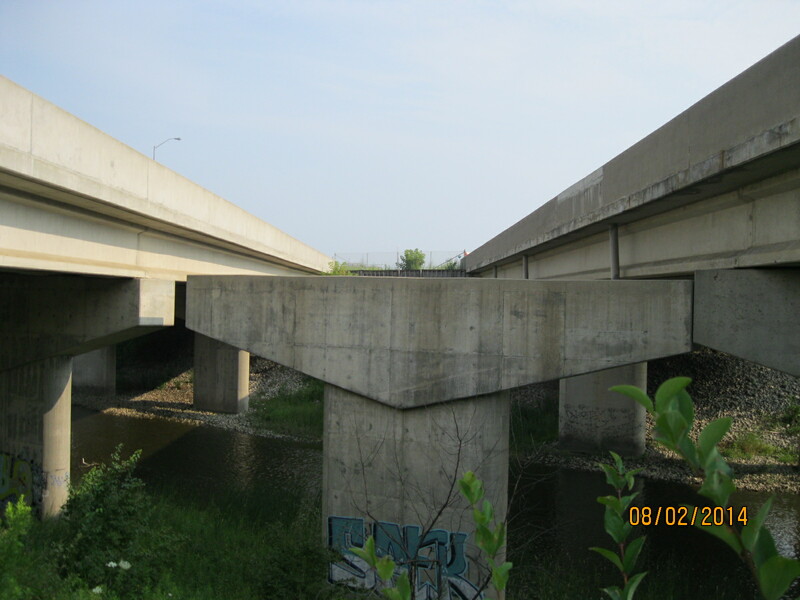 The part that used to flow under the bridge still has water in it and backs up from the river down stream when there is flooding, providing some flood control. 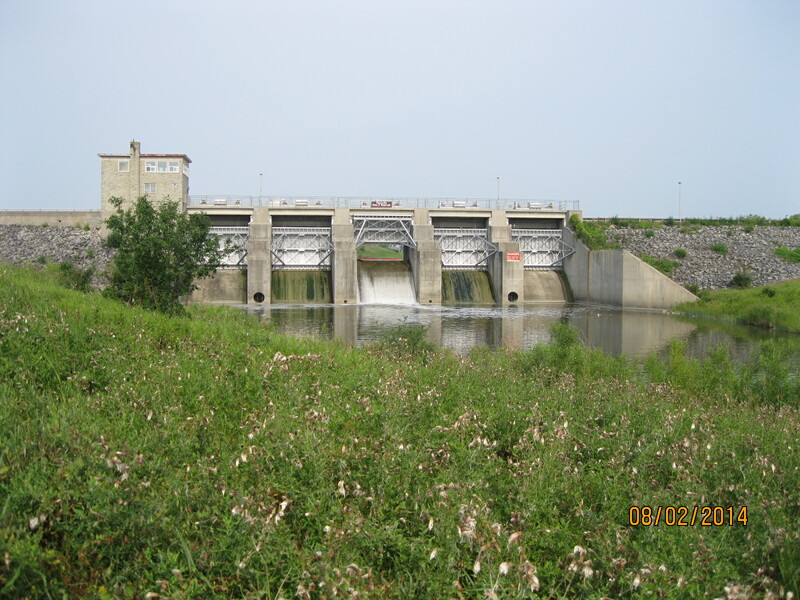 The picture below is taken from the bridge looking east. In 1821 the mills were sold to Thomas Helliwell Sr. and John Eastwood. Helliwell Sr. came from Todmorden in England and it is because of him that the name of Don Mills was changed to Todmorden Mills. 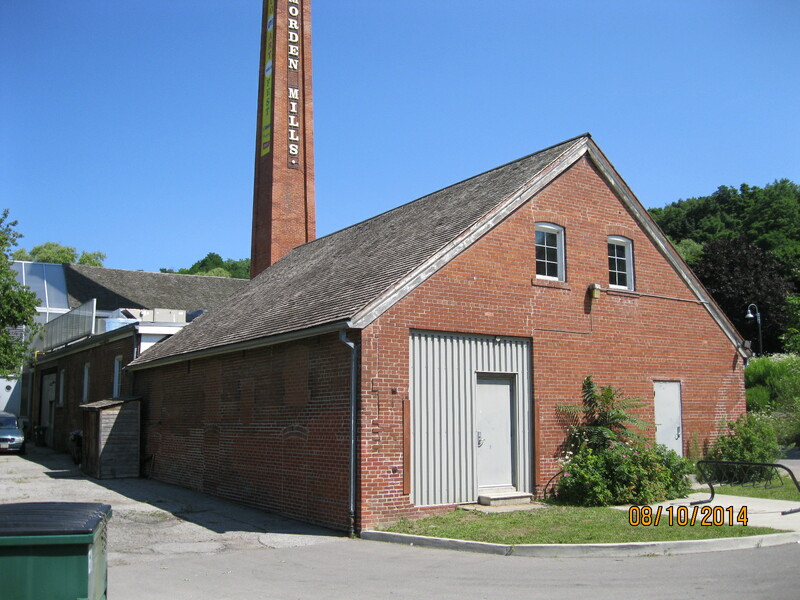 One of the first things Helliwell did was erect this building as the brewery and distillery. 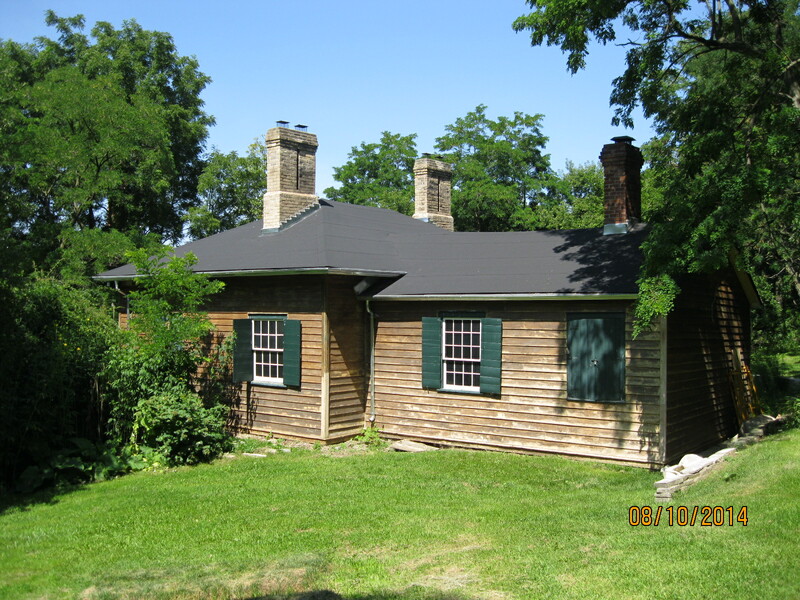 Thomas Helliwell Jr. built this house in 1837 out of bricks made from clay he dug out of the hillside behind the house. The bricks were not baked but only sun dried and so they would crumble easily. 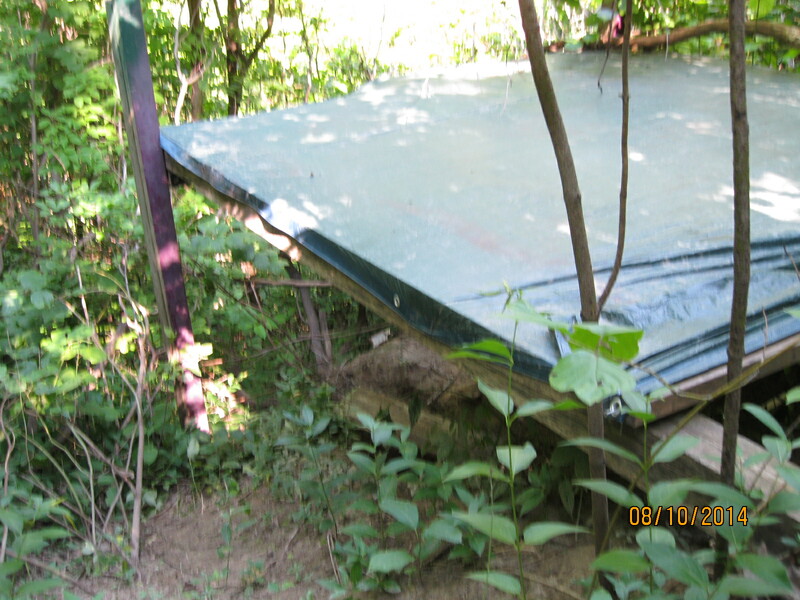 For this reason a protective coating of stucco was applied. 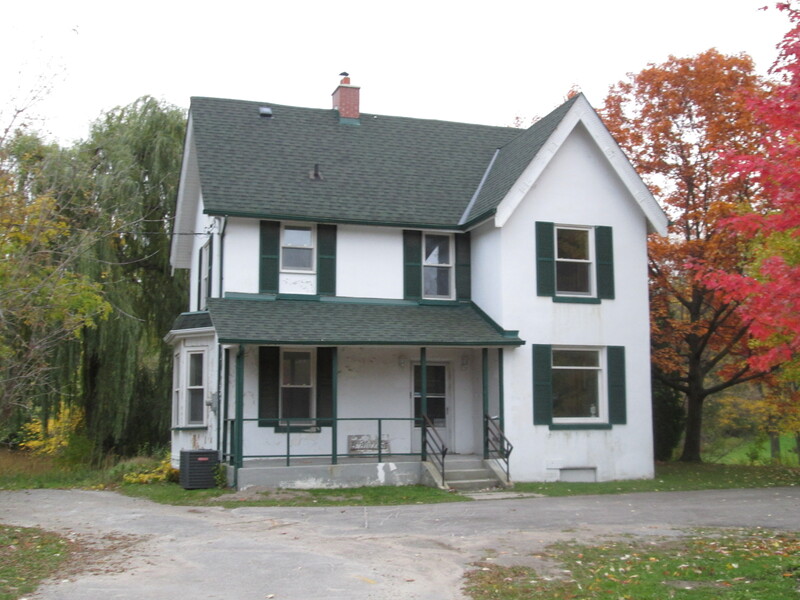 The portion of the house at the rear has the notable characteristic of no windows breaking the roof line that suggests it was originally a log home. 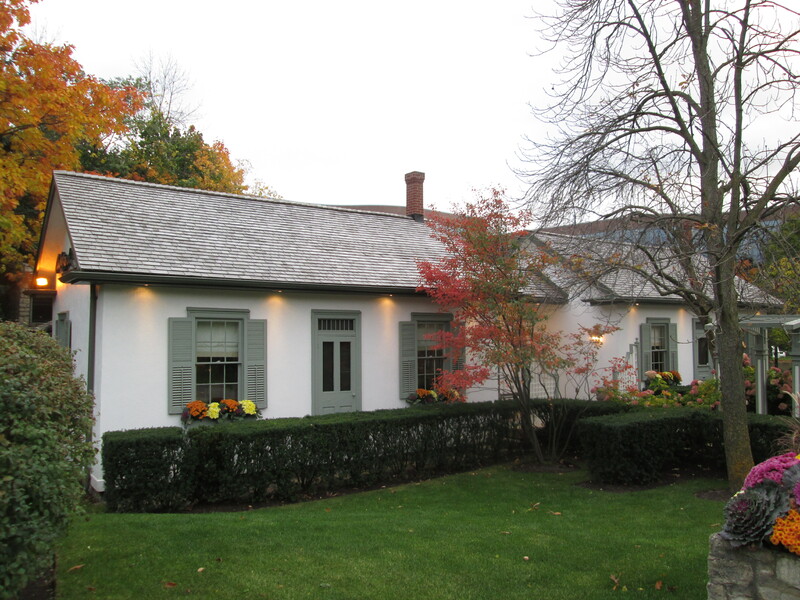 The two story brick and stucco addition on the front was likely framed and then veneered with bricks and stucco. The old flag pole still stands on the front lawn of the Terry House. 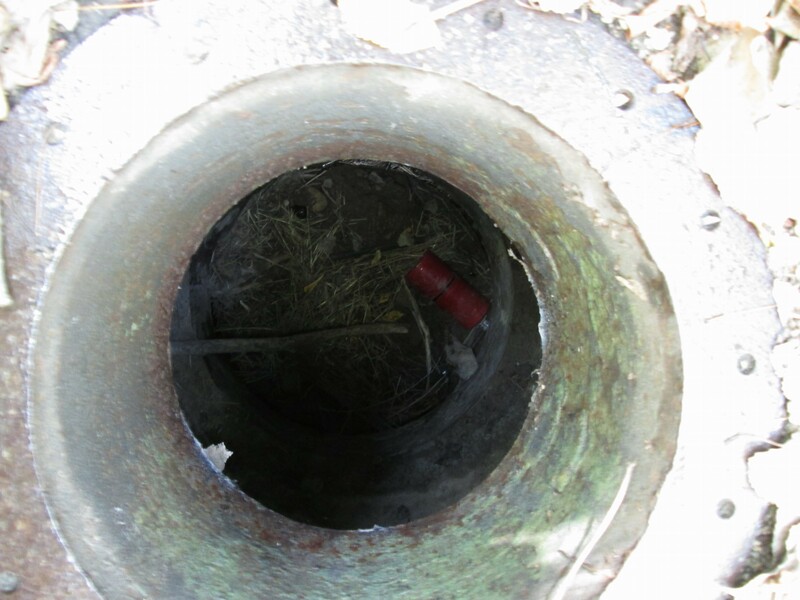 Note the wooden cradle mount at the bottom of the pole. When Thomas Taylor died in 1880 the mills were handed over to George Taylor’s son’s who added the Don Valley Pressed Brickworks to their empire in 1891 just across the river from Todmorden. 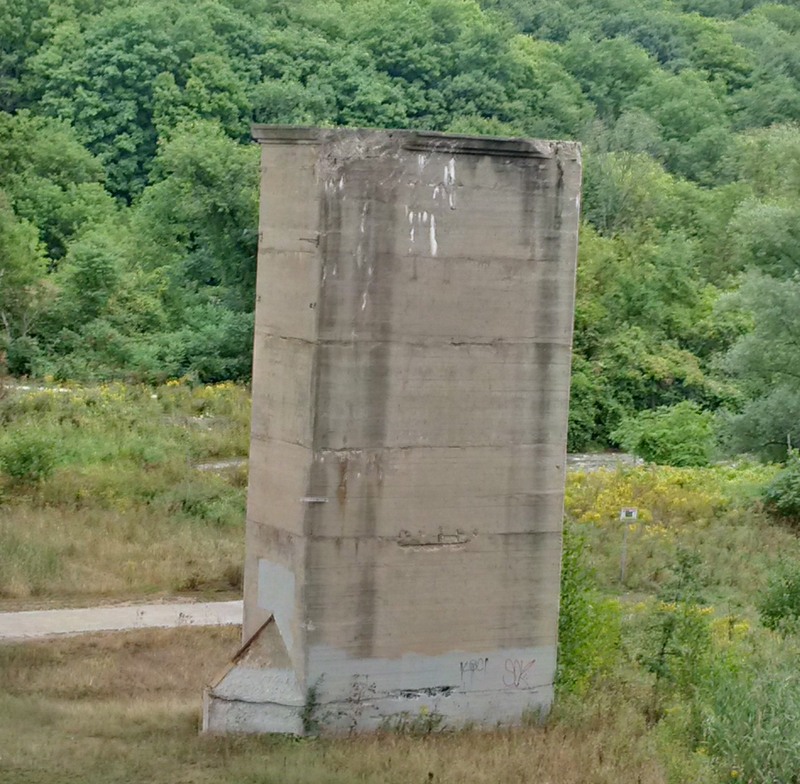 The Don Valley Brickworks produced many of the bricks for the construction of Late Victorian Toronto. 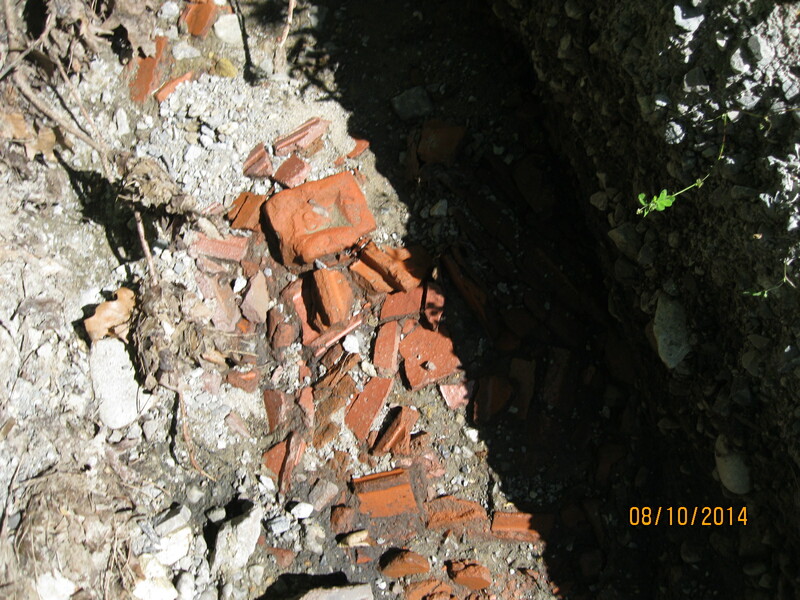 Broken or defective bricks were dumped in the valley all around Todmorden. The road leading to the bridge over the former Don River is made of bricks but is itself built on several feel of broken bricks. 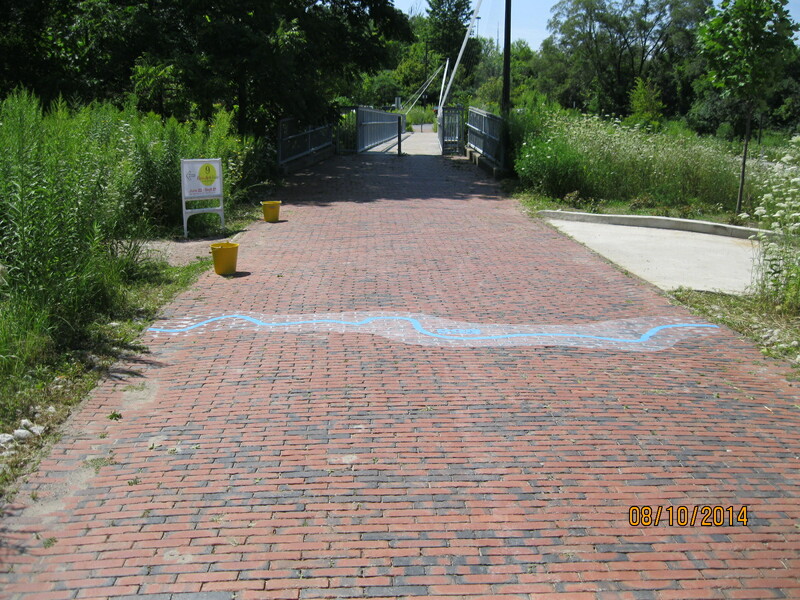 The blue line on the bricks in the picture below shows the one time bank of the don River. A little up stream is old Todmorden dam. This is a very quiet place to just sit and contemplate the people who made this city out of the woods around them. 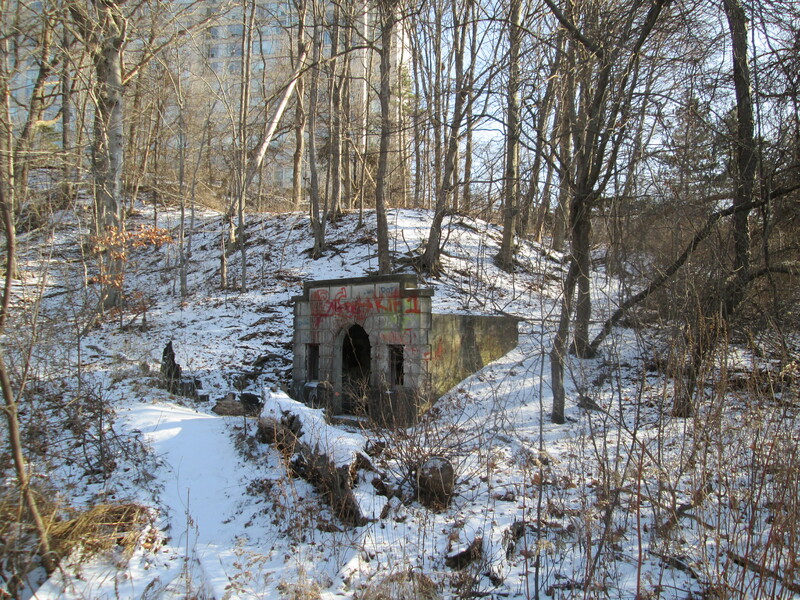 The Don Station was built by the Canadian Pacific Railway in 1896 near Queen Street and the Don River. 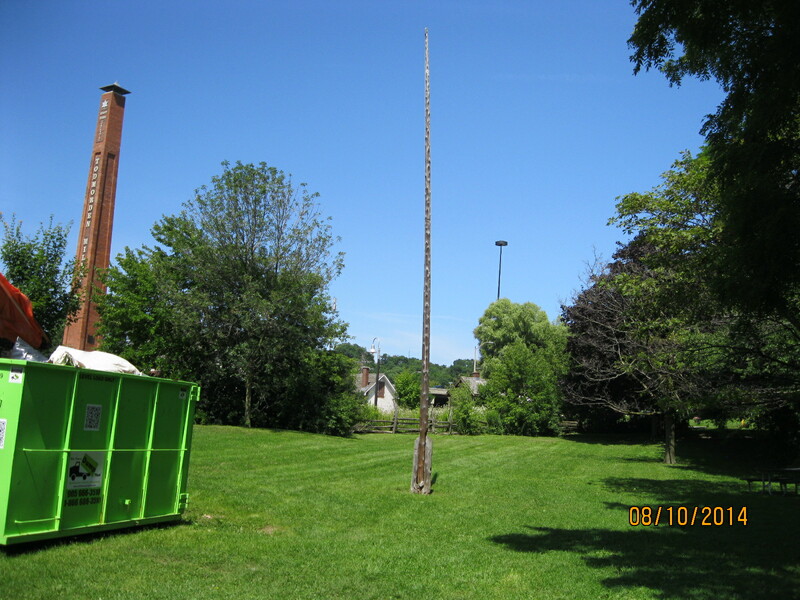 Between 1969 and 2008 it was on display at Todmorden before being moved to it’s new home in Roundhouse Park. 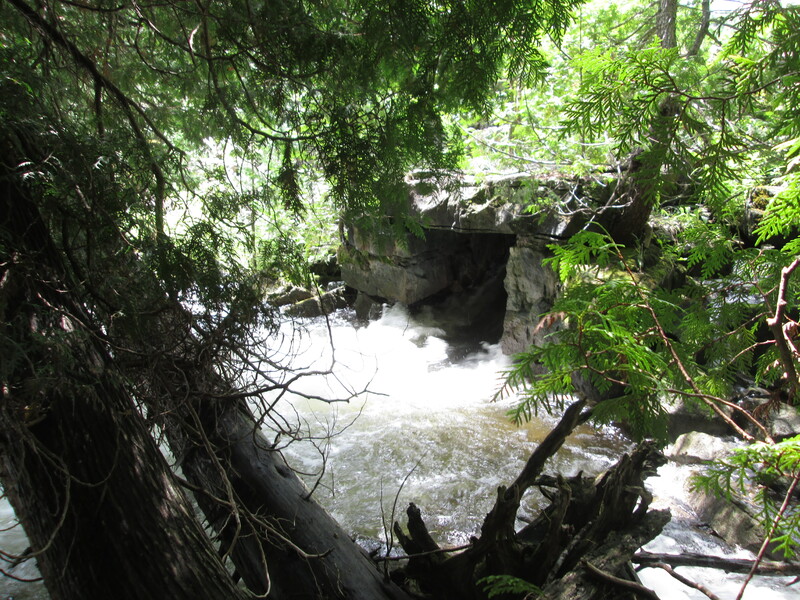 This entry was posted in Don River, Hiking GTA and tagged Don River, GTA, Todmorden Mills, Toronto on August 11, 2014 by hikingthegta.